Golf is played in 208 of the worlds 245 nations. What makes it such a great professional sport? I really enjoy the challenge mentally. It’s about beating the course and not yourself. You don’t have to win to be a winner. Don’t get me wrong, the lows are low, but the highs of coming out on top of your game and possibly on top of the leaderboard are both mentally and financially rewarding. Also, in terms of women’s professional golf, amateur male golfers can relate to how far we hit, as its similar to them. They can learn a lot from our game whereas the professional men are none relatable as they hit it 300 yards off the tee. Who inspired you to pursue your career in golf? My dad played golf and got me into it; I was then lucky to have an excellent coach from a young age who taught tour players and I wanted to be like them. I was part of a tremendous junior section at the golf club that a lot of my school friends were also in. I progressed through age groups and levels, club, county, national and international. When I went to Loughborough University, I was surrounded by elite athletes and Olympians, and things got serious in my game. It became a natural progression to turn pro as all my peers were. I wanted to continue playing against the best and pushing myself. Having studied sports science at Loughborough University can you share the physical benefits of playing golf? Walking for 7km is an obvious benefit. Free air and if you carry your own bag which can be up to 20kg. Other advantages are that you have 4-5 hours away from your phone, emails and social media. You can play golf forever; I play still with my dad who is in his 70’s. Mentally, the challenge of getting better is also great. Golf can often struggle to attract a younger generation, so what can be done to get more young people golfing? I find working at The Range in Manchester that our clientele is much younger than your usual golf club. Being in Spinningfields and allowing people that work in the city to pop in at lunchtime and after work is perfect for their busy lifestyles. Golf needs to have a short form like cricket does. You can play nine holes here in 60 minutes. I think having younger role models is always helpful. Seeing Niall Horan and Justin Timberlake hosting professional events and being visible on tv on social media also helps. What advice would you offer young golfers starting out in the sport? Go to a Driving Range or visit us in the city centre and experience social golf, no rules, no dress code and a relaxed atmosphere. The feeling of hitting a golf ball sweet is something that everyone needs to experience. Once you get the club in your hand, it becomes addictive. You will want to hit the ball further, straighter, higher and I hope the bug will be with you forever. Golf as a sport has come a long way in the past decade, and I encourage anyone to give it a chance. You have achieved so much in your playing career, winning several championships and representing England and Great Britain. Could you talk me through your top career highlights and what they meant to you? I have played in 5 British Opens including the monumental first women’s visit to St Andrews. Initially, women weren’t allowed to join the club so playing at that course in the women’s open was a big step forward in terms of equal opportunity. The US Open was an incredible week last year; I had to qualify and go through a playoff to get into the field. The US Open is the highest prize fund in women’s golf. I was lucky enough to hit the opening tee shot of the 2018 event at Shoal Creek and lead the tournament early on. Another career highlight for me was the 2017 Spanish Open at Aloha. Holing my final shot for eagle to jump into 3rd spot and earn the biggest cheque of my career was a huge buzz. It was live on Sky Sports Golf so all my family and friends could share the experience with me. There is currently a women’s revolution in sports, with the Williams Sisters, Ronda Rousey etc. becoming huge international mainstream stars. Can you see the same thing happening in the golfing world and who do you believe could be that break out star? I think women’s golf needs a superstar. Sports flourish with a single player who dominates. Like tennis (Serena), athletics (Bolt). We had it with Annika Sörenstam, and we hoped Michelle Wie could achieve that but it hasn’t happened with her. 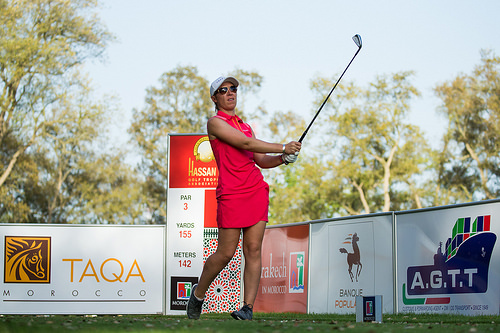 I would love to have Georgia Hall or Charlie Hull be the leading lights in women’s golf from an English point of view. 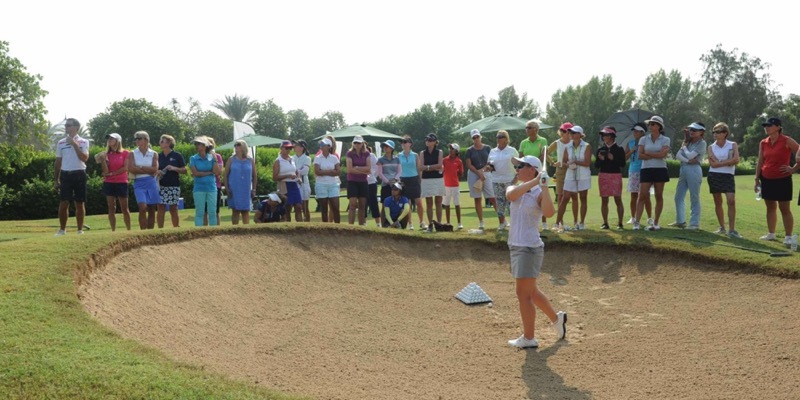 Six-time Ladies Tour winner Mel Reid was recently quoted as saying “Inequality in golf? ‘To be honest, I think it is getting worse”. What are your thoughts on the topic and what changes do you feel need to be made? I think what Mel is trying to say is that she can see the men’s prize fund increasing dramatically in Europe and the women’s game in Europe fading away. This comment was aimed at Europe, not other golf tours such as LPGA and PGA. Mike Whan became CEO of the LPGA, and they are playing for more money than ever and have increased their tournament schedule. Mel is speaking out and getting women’s golf noticed and I admire her for that. She isn’t being grateful for taking part. She wants to earn money as a professional golfer and be paid for the hard work and ability she has. Men and women can play on the same course and venue. Our money isn’t equal, but women’s professional golfer can still earn an excellent living compared to other sports. You now help nurture talent at The Range, what are the aspects of the role do you enjoy the most? I enjoy helping people improve. When I get messages or comments about how their golf game has improved and scores improved when playing at the weekend or in competitions, it brings a smile to my face. I have so much experience of playing the game that I enjoy passing that on. With the technology we have at The Range the pupil can see why the ball is going where it is going. Be it good or bad. We can analyse everything from the ball, club, pressure, visual data. Which can be put into a formula for them to play better golf and shoot lower scores which is the whole idea of golf. It’s not about playing golf swings; it’s about playing golf.